I’ve done well on my schedule today~~ I woke up at 5:30 and I’ve actually had more energy today even though I had less sleep… o.O I probably do need a nap though. Haha. Well, I’ll get to bed sooner tonight for sure. So anyway… today I’ve pretty much just been learning/practicing my katakana and working on this picture~ It’s been a good day so far, I think. 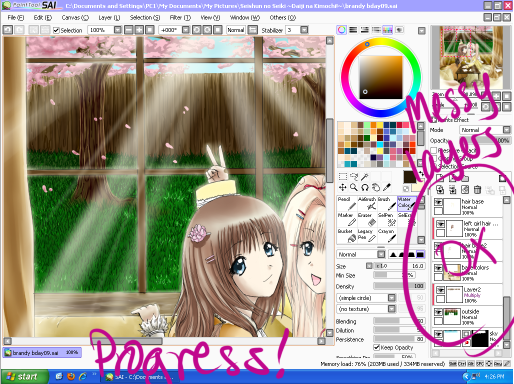 :3 Right now I’m taking a break to type this up and watching Lulu’s Livestream~ ^^ Come watch! Posted in Art, Japanese LanguageTagged art, japanese, katakana, layers, livestream, luluseason, progress, schedule, screenshotLeave a Comment on Progress Update!!! !